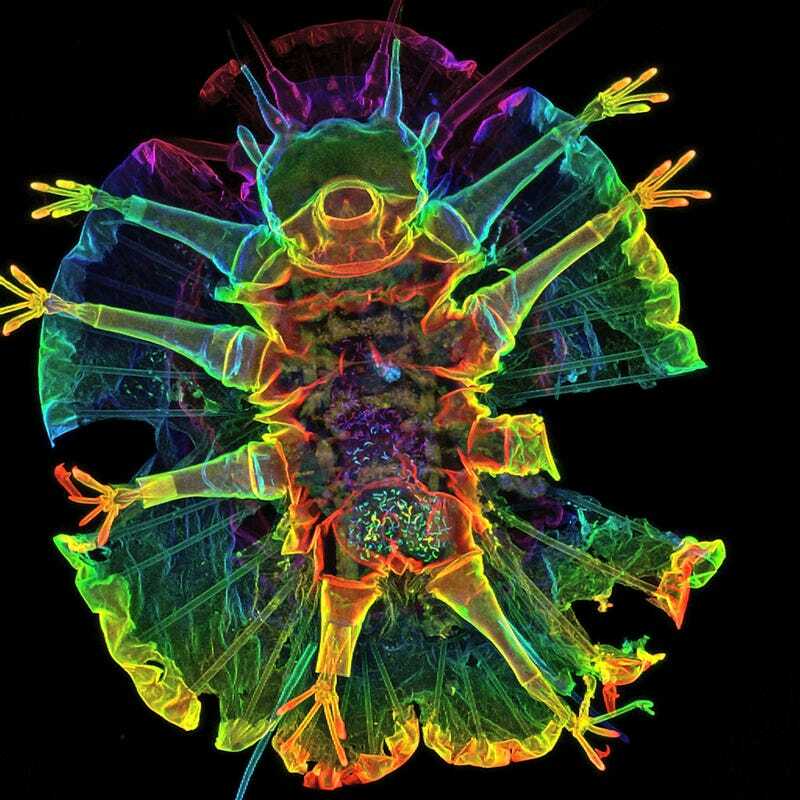 Nicknamed water bears and moss piglets, the tiny creatures called tardigrades are adorable under the laser scanning microscope. Plus they can survive in the vacuum of space. The biggest tardigrades never get to be more than about 1.5 mm long, and most of them spend most of their days eating algae or bacteria and swimming around in droplets of water on moss or lichen. In fact, many kinds of tardigrades turn green when they eat because their bodies are transparent. They can go into a state of suspended animation and survive for a long period of time without water — and even without oxygen. Scientists have discovered that they are able to survive even in the vacuum of space. The image above shows the internal body structure of the tardigrade. The oval area is the hard outer shell, known as a cuticle. Their soft, unjointed legs stick out from under it, much the way the legs of a potato bug stick out from under its segmented shell. Scientists at the University of Hamburg-Zoological Museum Hamburg were also able to see the animal's internal organs. The team used a confocal laser scanning microscope, which creates sharply defined photographs with a shallow field of focus. Stacking several photographic layers, each assigned a different color, they obtained this well-defined image of the entire animal. If you want to see even more pictures of tardigrades, I recommend checking out the Goldstein Lab's website, at UNC Chapel Hill.